The Massachusetts football team won’t know for certain whether starting quarterback Blake Frohnapfel will be healthy enough to face Akron on Tuesday until game time, as he continues to deal with a right leg injury. 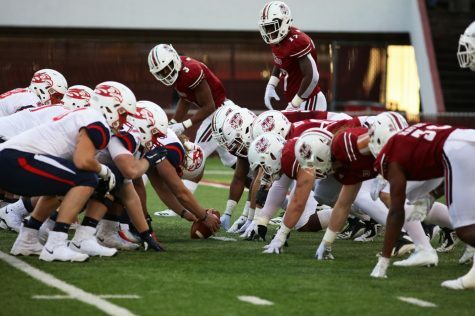 But the Minutemen have contingency plans in place to face the Zips without the nation’s fourth-highest leading passer, as redshirt freshman Austin Whipple assumed Frohnapfel’s duties throughout the week. Whipple’s appeared in two games this season – both in brief roles – and hasn’t thrown a live pass since he was in prep school at the Salisbury School two years ago. 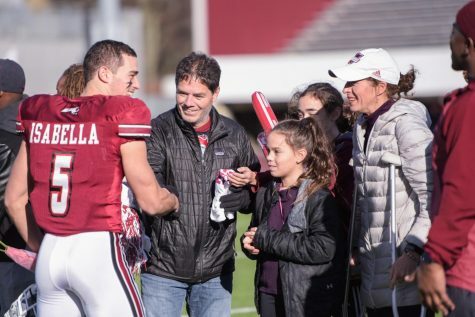 Yet UMass coach Mark Whipple said he isn’t all that worried about his son assuming the starting role. Instead, he’s focused on the Akron defense that awaits the Minutemen. But the Minutemen may be catching the Zips at the right time. Akron’s lost its last four games, its most recent a 55-24 blowout to a scuffling Buffalo team. Before that, the Zips lost to Bowling Green 27-10, Ball State 35-21 and Ohio 23-20. UMass counters as winners of three of its last four matchups, but all of those came with Frohnapfel at the helm. 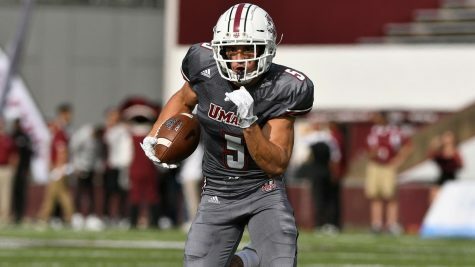 Whipple said the Minutemen will focus more on the running game, meaning running backs Lorenzo Woodley and Shadrach Abrokwah will travel to Akron with higher expectations and more involvement in the game plan than in recent weeks. 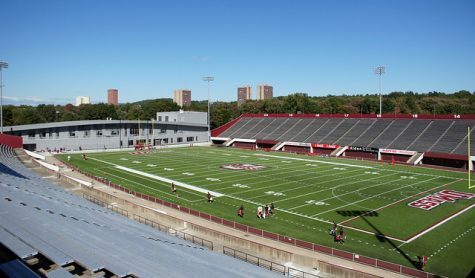 Last week against Ball State, UMass attempted 44 passes and handed the ball to Woodley and Abrokwah a combined 30 times. 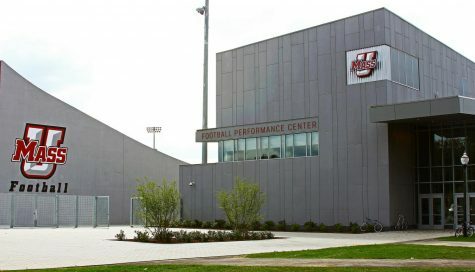 A majority of those handoffs went to Woodley in the fourth quarter – the Minutemen at one point ran 14 straight run plays – following Frohnapfel’s injury. Woodley expects that type of pattern to last the entire game against an Akron defense that stands out on tape. 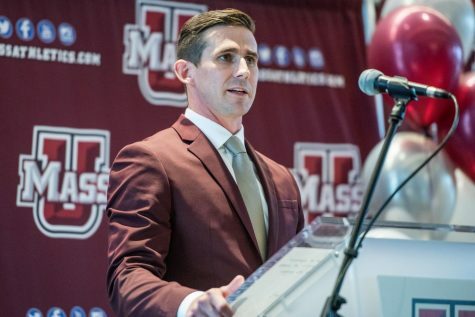 The added emphasis in the run game comes at a time when UMass has turned the corner on the ground. Through the first five games of the season, the Minutemen averaged just 60 yards per game on the ground. 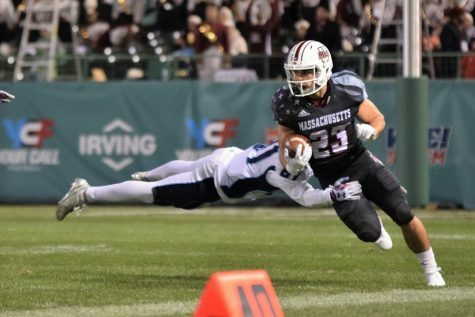 But in its last five, the Minutemen are averaging 156 rushing yards per game. Whipple attributed the growing success to the offensive line’s continuity. It’s developed a consistent rotation of linemen – it rotates in four guards between offensive tackles Tyrell Smith and Elijah Wilkinson – and no offensive lineman has missed significant time due to injury. 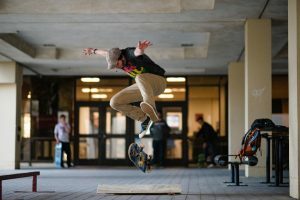 According to Smith, the line now has a feel for each other. 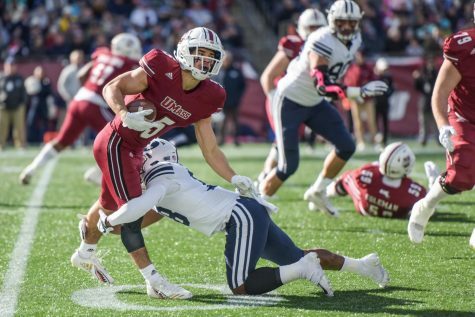 It’s opening up holes for the running backs, and UMass will rely on that against an Akron defense that, according to Woodley, has linebackers which swarm to the ball. Woodley is particularly carving himself a specific role. The Minutemen have shown a propensity to give fourth quarter handoffs to Woodley. Against the Cardinals, he accumulated 54 of his 90 yards in the fourth quarter alone. He played a similar role against Kent State on Oct. 11, when he earned every single yard of the team’s final offensive scoring drive. Playing the role of the “closer” is something Woodley is relishing and has played since high school. 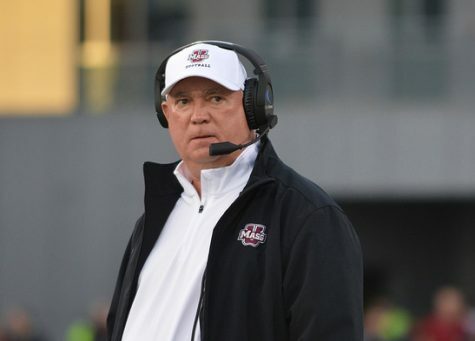 If UMass has its way, Woodley will assume that role yet again Tuesday night at Akron. The game is scheduled to start at 7 p.m.